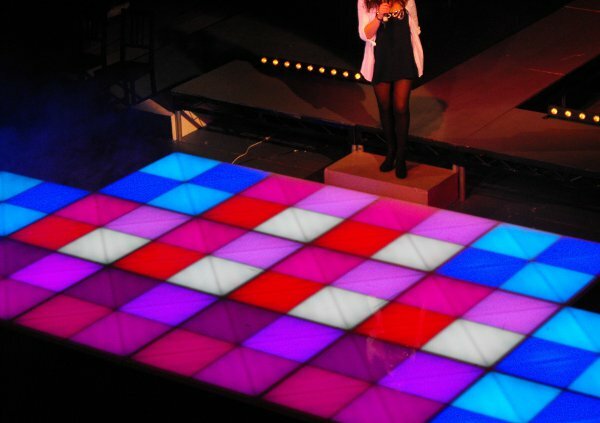 The floor system consists of 1 Metre by 1 Meter Floor Panels which are split into 4 squares which each square split into 2 triangles giving you a total of 8 separate sections in each panel, each section is illuminated from below by Red, Green & Blue LED's which are all independatley controllable, this allows you to produce some amazing effects on the floors or even something simple such as the floor all one colour. The 1 x 1 Panels all link together with power, data and screw plate connections, this allows you to produce any short of size & shape floor you wish. We can supply a basic controller or a preprogramed multic function controller. you are welcome to collect the floor and use yourselves or we can deliver, setup and even opperate for you. For more info and pricings give us a call or send an email.